Penetration and prevalence of mobile digital devices used to surf the web is growing at an astronomical pace worldwide. Unfortunately, most websites are not optimized for these mobile digital devices. Digital devices quite often are limited by display size or screen size and need a different approach to ensure content is laid out on screen as its intended. There are numerous screen sizes across a range of Smartphone’s, “phablets”, tablets, desktops, game consoles, and smart televisions even lately wearable digital gadgets. Digital mobile device screen sizes change fast, and it is important that innovation on websites like responsive web design brings in adaptability to any screen size, whether for today’s gadgets or for those in the foreseeable future. Responsive web design therefore, is effectively responding to the needs of the end users and the technology of the devices they are using. Content layout dynamically shifts based on the screen size and inbuilt capability of modern digital devices. For instance, on most Smartphone’s today; users may see content shown in a single column view; whereas on tablets it may display similar content in two columns, vertically or horizontally. -Perfect technology application on either CSS or HTML helps to resize, hide, shrink, enlarge, or move content to fit any screen size. This makes the whole browsing experience an adventure and exploration for the users. -An integrated or unified user experience makes potential customers take faster decisions while online. This naturally translates to higher bottom lines and faster turnover. Optimized websites gain from the traffic side too as target or niche audiences find a one stop solution for their searches while surfing online. This makes websites an important sales outlet with high conversion rates. -Responsive design websites translate into easier maintenance and management. They are less cumbersome with a less crowded and fuzzy interface as it is designed for faster browsing. It eliminates need for two different websites serving the same purpose. Therefore, the ultimate maintenance cost is relatively low. -There is a great deal of online mobile traffic on adaptable screen sizes like smarphones, tablets and phablets these days. This presents an opportunity for the websites to engage with a wider online demographic for stronger online presence. Websites with adaptable responsive design appeal to modern users who surf the internet on a range devices like Smartphone’s, tablets or phablets and expect a seamless drift across websites with less or no interference. Responsive designs ensure easier customer retention which pushes a websites online presence appealing to a wider reach and audience. 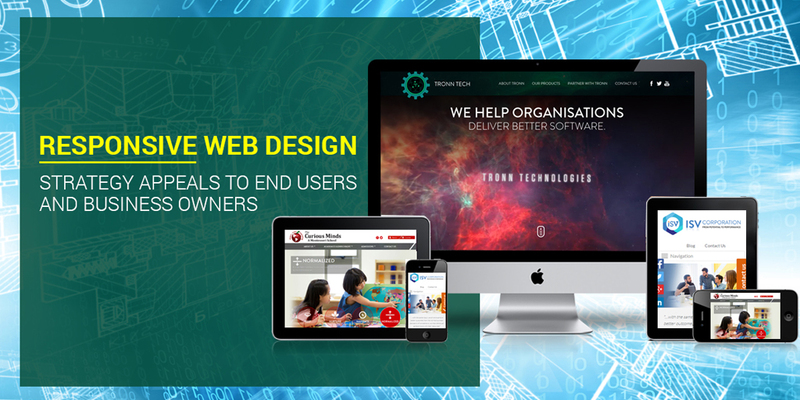 Whether it is for a business purpose or for the target end user, responsive web design is a win –win for all. For the flexibility and adaptability to all screen sizes enhances the website navigation and opens increased business opportunity. What are the 5 Effective Steps that Enhance a Websites Search and User Experience?